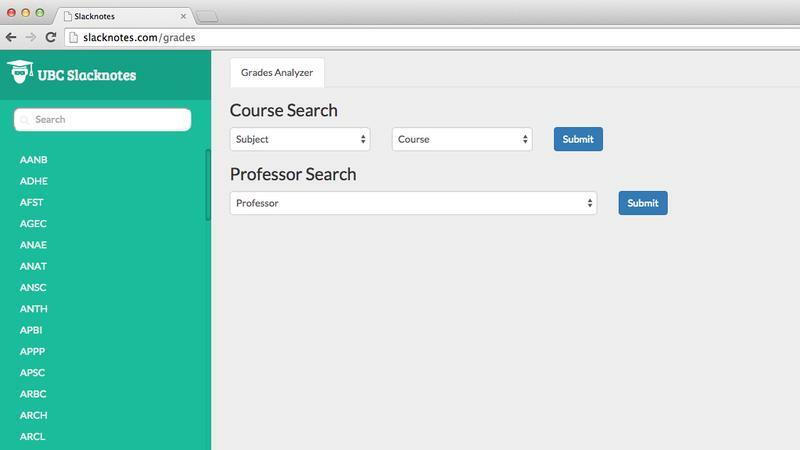 Slacknotes, a project from fourth-year computer science student Chris Zhu, lets you search any course currently offered at UBC and view its grade averages since 2007. The same goes for profs. On each course's individual page, there's a chat room for discussion and sharing files related to the class, which Zhu says was the initial focus of the site. "It's a place where you can do things that professors won't let you do ... A lot of existing solutions are monitored by professors and I've always found it difficult to ask what you want to ask," he said. While Zhu says he doesn't encourage cheating, he's "not going to prevent" people sharing assignments or exam questions in the chat rooms. Zhu is also the creator of Eyeout, a service to alert you when a course you want to get into has an open space. It blew up online becoming the tool of choice for students looking to get into popular classes. It sent 16,000 messages over the summer to 6,000 students and still has 4,000 ready to go if and when spots open up. "That was pretty popular and I figured [Slacknotes] was along the same vein," he said. Zhu says he plans to add more features — like filtering specific class averages by year and professor as well as listing the hardest/easiest courses at UBC — starting this weekend. It's already a great concept, but what does he envision Slacknotes becoming in the future? "Do I have a vision?" he asked his friend, Mitra Nowroozi, who was sitting beside him. "I don't know. I just like building things that people will use."